Lowest prices. GOTS Certified Organic. 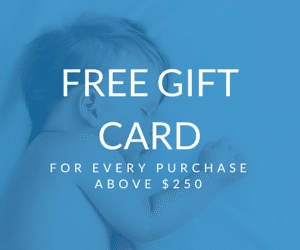 And FREE Shipping! 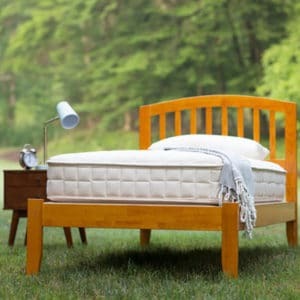 Say goodbye to Dust Mites and Bed Bugs! 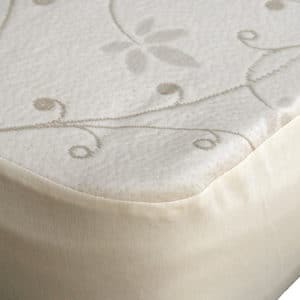 100% Certified Organic Protection from Allergens. 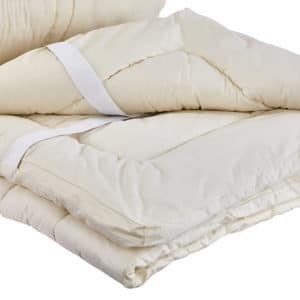 100% certified organic cotton allergy dust mite duvet cover. GOTS certified, this organic dust mite cover is the most natural, non-toxic product available for dust mite allergy prevention. 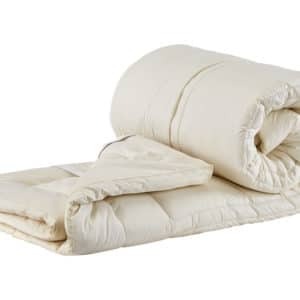 This soft certified organic cotton fabric is more comfortable than other allergy dust mite covers. 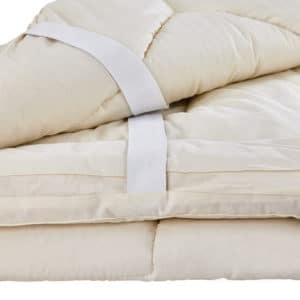 There are absolutely NO chemical treatments added to these pure 100% organic cotton covers. 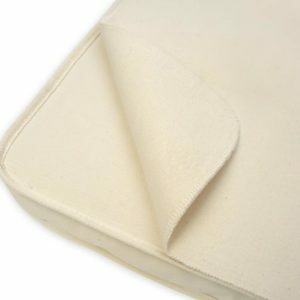 This uniquely designed, organic cotton dust mite allergy cloth shields your comforter/duvet from pet dander, dust mites, bed bugs and other harmful allergens. It is tightly woven in a special overlap process. 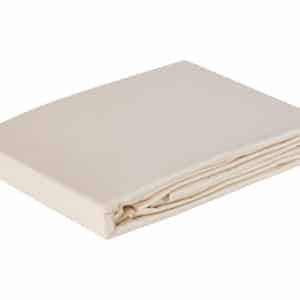 The organic cotton cloth is woven so tightly that allergens cannot penetrate it. Pore size less than 5 microns for best dust mite and allergen protection and a breathable, comfortable fabric! Pore size is the diameter of the space or hole between the threads. The average waste particle of dust mites is approximately 9 microns so the pore size must be less than 9. 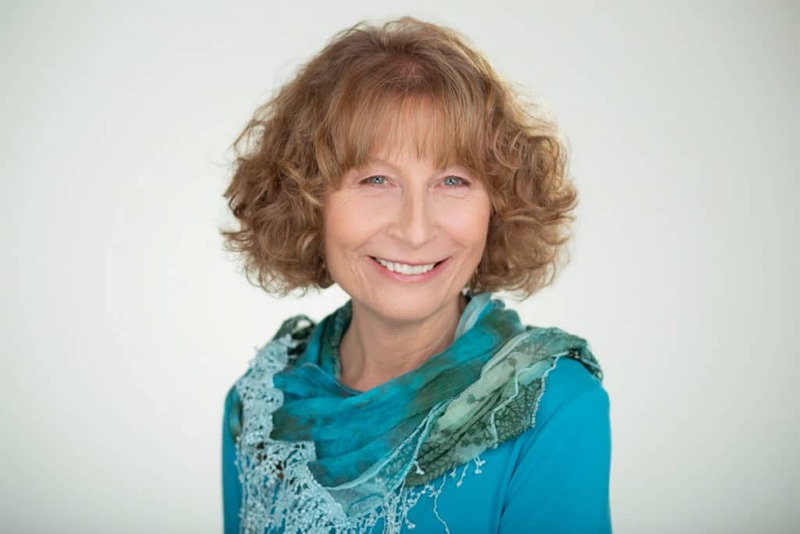 Typically, any fabric with a pore size less than 6 or 7 will block all allergens including pet dander. Anything below 5 microns is premium and the difference between 5 microns and 2 microns is not an issue at all. Both will equally block all allergens, including cat allergen. 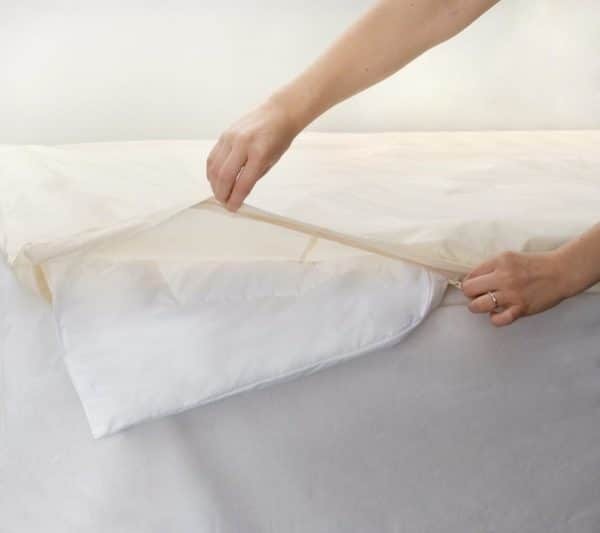 A very low pore size (1 or 2 microns) gives you low air flow, which will make the fabric hot to sleep on. Remember that thread count has nothing to do with pore size. 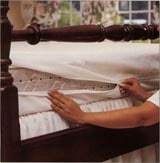 1000 count sheets for example have more threads per square inch but the pore size is not maintained. Thus, these fabrics will do nothing to encase the allergens. 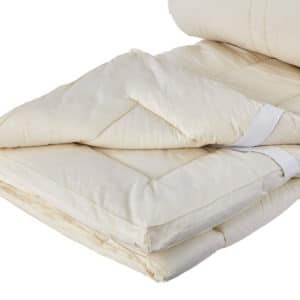 These dust mite covers are made with the BugShield Zipper System designed to give you extra bed bug protection from an accidental opening once you have closed the zipper. 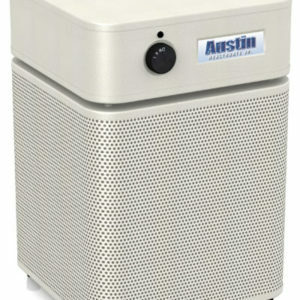 This system provides added security if exposed to bed bugs. Zipper runs along the bottom of cover only. 100% Organic cotton for the ultimate in comfort without sacrificing efficiency. No chemical treatments whatsoever! No formaldehyde, no antimicrobials, no fire retardants, no bleach! 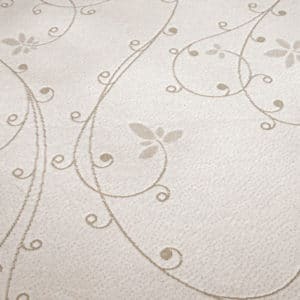 With a mean flow pore size diameter of 4.91 microns, this fabric is one of the most effective barriers against pet dander, dust mites, bed bugs, and other harmful allergens. No Plastic or Vinyl Membrane. Ideal for those who have chemical sensitivities and skin irritations. Uniquely heat samphorized to prevent shrinking and maintain the integrity of the pore size through multiple washings! 3.4 oz per square yard with 285 threads stitched per square inch. 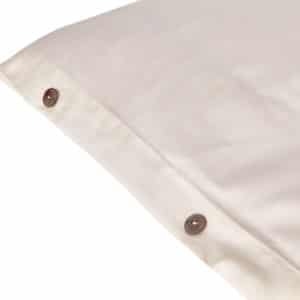 All our covers are sewn with 12 stitches per inch for ultimate strength in the seams. We only use heavy gauge nylon zippers. 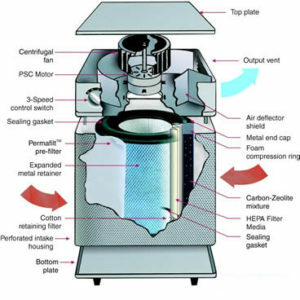 Air permeability reading of 5 which indicates a wonderfully breathable fabric. 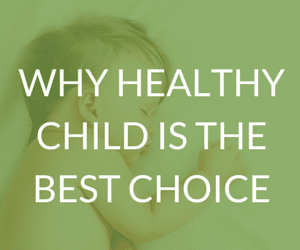 Healthy Child pays shipping within the Continental US. Cover ships from Georgia via UPS. We email the tracking detail to you upon shipment. Please contact us for orders shipping outside the Continental US. View our Organic Cotton Dust Mite Allergy Pillow Cover. Please contact us with any questions or to order over the phone. Machine wash in WARM water with mild detergent with the zipper closed as needed. Tumble dry at LOWEST setting. Do not iron, bleach, or dry clean. Customer pays all shipping costs. Product must be returned in original packaging, UN USED and in the original condition as received within 60 days of receipt. We will refund you as soon as manufacturer processes return. Did you know that indoor air is often 2-5 times more polluted than outdoor air? 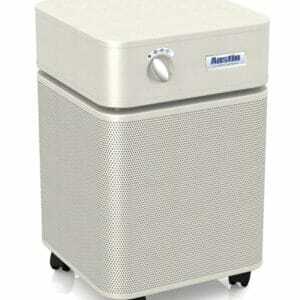 Please take a look at our Air Purifiers for more information.